You would think that with the reception received by the introduction of the Nokia N9, the company's CEO would be raving about the MeeGo OS that powers the device charged with keeping the Finnish firm alive. But instead, Stephen Elop is already looking beyond the N9 to the Windows Phone series of Nokia smartphones. Elop says that the N9 depends more on the Qt application framework more than the MeeGo OS. But the Qt framework allows applications to be programmed for three of the OS used by Nokia, but not for the Windows Phone series . And that means that Nokia cannot go back to MeeGo. But that doesn't faze the executive, who says that Nokia's future is Windows Phone. Elop says, "I have taken part in the conversations with the teleoperators and I have been part of the consumer test groups. The feedback has been extremely positive and I am sure that the Windows Phone system will be a great success." 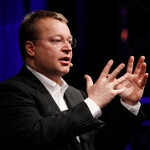 As for those Nokia employees who fear that Nokia will become a subcontractor for Microsoft, Elop rejects that sentiment. He promises that, "Nokia will continue its research and development on the software side, as well as in services and equipment design. We will build inventions for our Windows phones that will make us stand apart from our competitors and bring significant additional advantage to our application developers." The CEO also says that he receives emails from the software R&D team and says they are motivated. While Elop might feel this way now, we wonder what would happen should the Nokia N9 become a mega-hit globally. From the sounds of it though, even if that should occur, as far as Nokia's CEO is concerned, MeeGo is MeeGone. FLAY HIM! BURN HIM AT THE STAKES! Elop is a MS mole! Android would've revived their dumb asses. Should've jumped ship when it came to shore. lol I can't believe I am agreeing with you. I know right? The first time for me was hard too, I threw up in my mouth a little. JK, gemini. Elop is such an idiot, why release a product with an OS that they won't continue with and are ready to drop. Instead he could speed up the production of Nokia's WP7 phones. How does he expect developers to create apps for an OS which will die very soon after it's release? thank you man2006,that Elop man is a fool,you can not come up with such a statement on an unrelease product an expect it to do well,what does he think the consume are? "fools like him"? He is just so busy pleasing his real bosses in Redmond. Here is hoping this W7 line of Nokia devices is a runaway train kind of victory. If they do poorly, that train can't come back to any other station. All those bridges will have been burned, tracks and all. I guess Elop got a call from Ballmer after Nokia released N9. After all Ballmer gave Nokia $1billion to work on W7. Just like the Yahoo CEO found out, doing business with MS comes with huge strings attached. Nokia cannot go back to MeeGo....another company will. Perhaps Nokia will hand it off to someone else? I believe LG, Panasonic and ZTE are supposed to pick up the meego platform. I know LG is at least playing around with it. It has been very well recieved at least on the demo with the N9. Someone will grab it if the OS is solid. Nokia continues its long line of smart business moves. In all seriousness though, I do think that's Elop just saying it so MS doesn't get all up in arms. I think Nokia will still develop MeeGo devices, but Windows Mobile will be their flagship. Brokia, the name fits it very well. The question is how will Nokia WP7 differentiate itself from other WP7 devices? 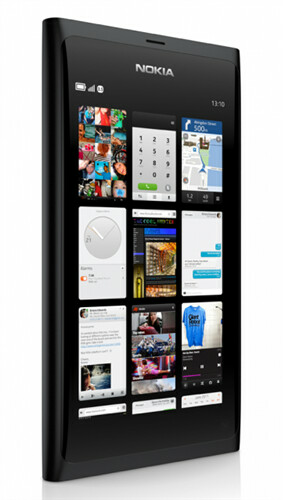 Pushing MeeGo should differentiate Nokia from ALL manufacturers that is until LG releases it's own MeeGo handset. I hate to say this but N9 might probably be N900 take 2. Meego is a great OS but if you consider how much support it got with other companies, it just makes sense to go for WM. Pairing it with Netflix and Xbox live would be great for nokia to be born again just like PlayStation did to Blu ray. However, there will growing pains in the Nokia fans and supporters and it would a rough transition for all sides. Truth as it is, fans are not really mad at Enlop or Windows Mobile, they are just as scared of change and what will happened next to our beloved device. For me, if Nokia dies for this transition, I want to see a warriors death. Fighting to the very end but when it dies, Android and iOS is wounded gravely. TONIGHT WE DINE IN HELLLLLLL!!!!! FYI: this is the exact post i made with other website except the word "warriors" is change to warrior's. Because i just figured out how to use discuss. Nokia and RIM seem to share a similar condition - CEO (co-CEOs in RIMs case) that are totally out of touch with reality. Maybe they could merge both companies and then sell the combined company to Huawei or some other Chinese company that is trying to get into the cell phone business? I do not think Mr. Elop is anywhere close to the level of sheer blindness of Abbott and Costello at RIM. He just believes in W7, and is willing to fly or fry on the faith he has in it. RIM is just stuck on an island, enjoying the Sunset without noticing everyone else in the Mobile industry is Sailing past them.